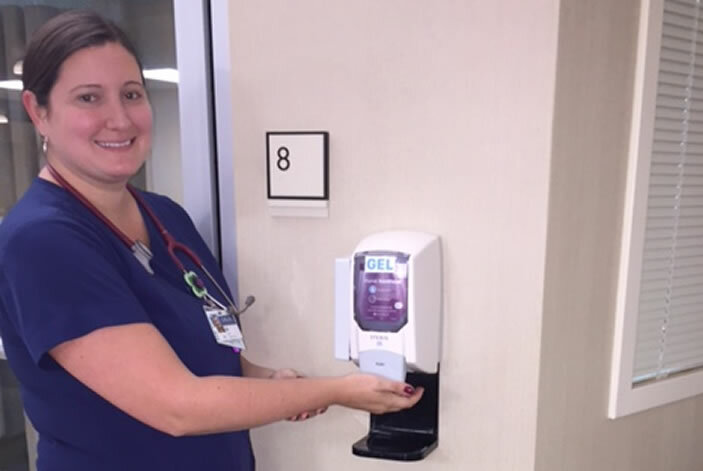 Allison Tomy at Emory Johns Creek Hospital tests out the new hand sanitizing station, located in the ICU. The new hand sanitizing station at Emory Johns Creek Hospital. Tadesse St. George, unit director on Unit 41 at Emory University Hospital Midtown, examines the new technology. 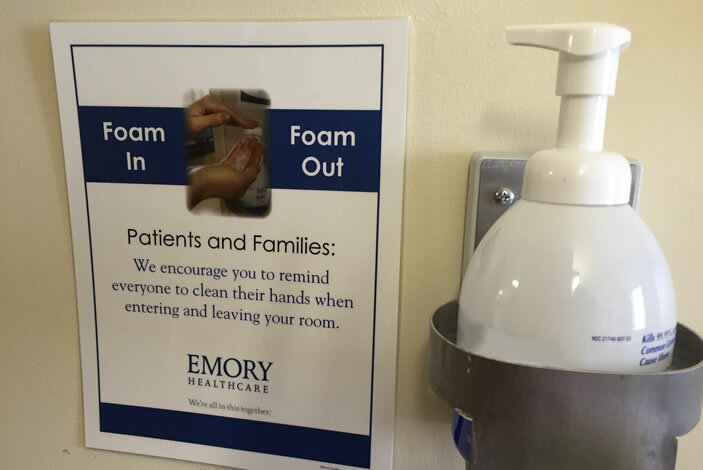 Staff and visitors are reminded to always “foam in and foam out” of each patient room. Emory University Hospital Midtown (EUHM) and Emory Johns Creek Hospital (EJCH) are testing new technology to determine if hand hygiene compliance can be increased among health care workers. The technology will be used to measure hand hygiene compliance and compare the effectiveness of different methods of providing feedback to employees on how reliably they clean their hands. The Centers for Disease Control and Prevention (CDC) estimates that in 2011, there were 722,000 healthcare-associated infections in acute care hospitals in the U.S. Many of these infections can be transmitted by contact, and health care workers can play a role in this transmission. According to the CDC and the World Health Organization, hand hygiene performance is considered to be one of the most important interventions to prevent infections in the health care setting. 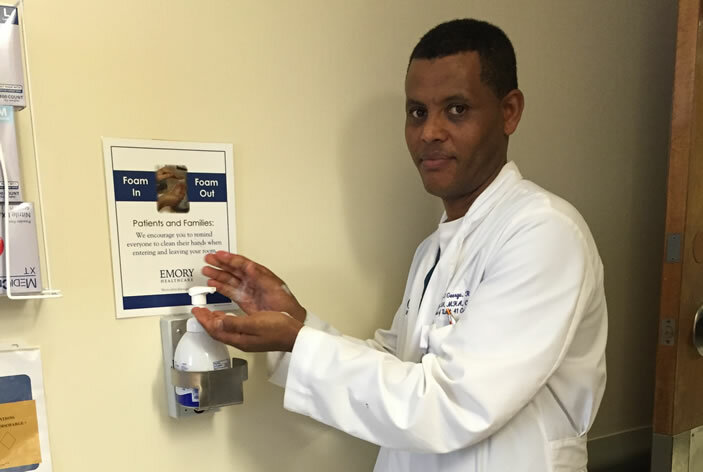 "By improving hand hygiene, hospitals can significantly reduce the incidence of infections," says Jesse Jacob, MD, associate professor of medicine in the Division of Infectious Diseases at Emory and hospital epidemiologist at Emory University Hospital Midtown. "Informing healthcare workers of their hand hygiene compliance has been a cornerstone of efforts to improve compliance. We hope a study like this one will help us determine the best means of feedback to employees to improve hand hygiene compliance." Jacob is the principal investigator (PI) of the Prevention Epicenter of Emory and Atlanta Consortium Hospitals or PEACH, which is funded by the CDC. The hand hygiene study is one of PEACH's three major projects. The Prevention Epicenters Program focuses on infection control and prevention research in health care facilities. 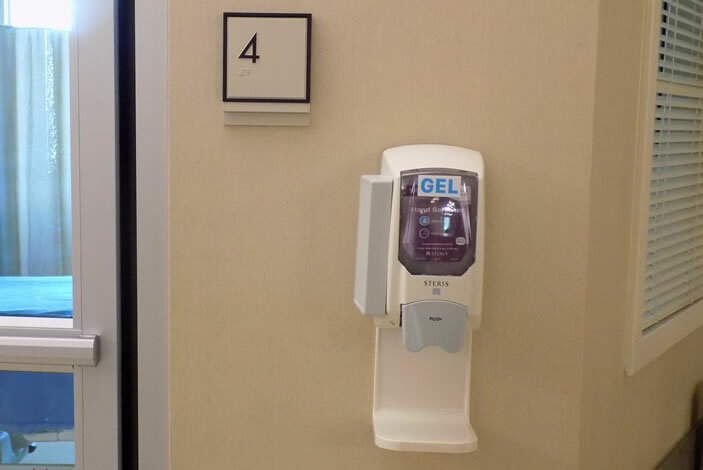 For this study, sophisticated electronic sensors have been attached to alcohol hand-rub and soap dispensers in patient rooms and hallways at Emory University Hospital Midtown and Emory Johns Creek Hospital. At EUHM, an urban teaching hospital, the new technology has been installed in five adult ICUs and on two other floors. At EJCH, a smaller community hospital, the monitoring units have been installed in one ICU and on one medical floor. Healthcare workers, who volunteer to be a part of this study, will wear badge reels that use Bluetooth technology to communicate with the sensors. The sensors can detect when a healthcare worker wearing a study badge reel is nearby and register if the alcohol or soap has been used. In addition, sensors in patient rooms use ultrasound to detect if badged or non-badged persons enter or leave the room, while monitoring for hand hygiene compliance. In some stages of the study, a voice reminder will sound if a healthcare worker enters a room and doesn't clean their hands. "Hospital staff and physicians can opt out of the study, but what interests me is how many people want to participate in the three-year study," says Marcia Postal-Ranney, RN, manager of infection prevention at Emory Johns Creek Hospital. "The purpose of this project is to look for cues to remind us what we need to do to make ourselves the best we can be when it comes to hand hygiene." The study units will initially receive their overall compliance rates using the electronic system. Then other strategies will be used, including immediate voice feedback on room entry and individual employee compliance for those using the study badges. Different voice reminders will be tested, as well. Combinations of these feedback methods will also be tested. "At Emory Healthcare, hand hygiene rates have been reported at about 60 percent using trained anonymous observers, but this is labor intensive and captures only about 20 observations per month for each unit," says James Steinberg, MD, professor of medicine in the Division of Infectious Diseases at Emory, and co-PI of the study. "Using the new automated system, tens of thousands of observations can be made per month. Our goal is to determine if providing individual compliance rates and immediate feedback with various voice reminders will produce an increase of hand hygiene more effectively than either intervention alone." Bonnie M. Jennings, PhD, RN, professor in the Nell Hodgson Woodruff School of Nursing and co-PI on the project, will conduct individual interviews to determine employees' attitudes and beliefs on hand hygiene in general, on being monitored and on hearing voice reminders. The hand hygiene research project is funded through a $2.2 million award (#1U54CK000453) from the CDC and its Prevention Epicenters Program.